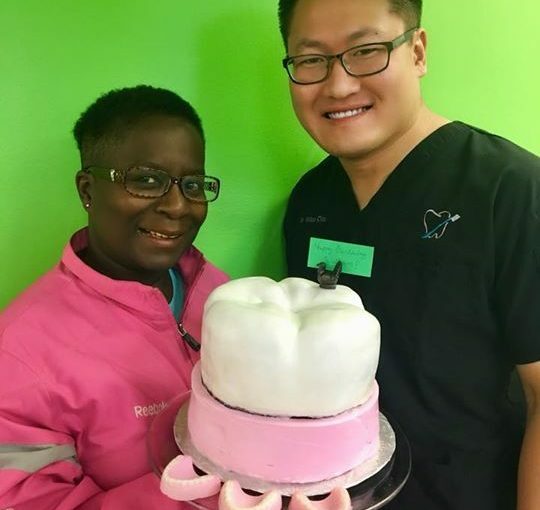 Special thanks to local business Apothecary Baking Company and owner Michelle for making Dr. Chin this dentalicious cake! I am a pretty good frisbee player and make awesome fried rice! Yes! I have a twin brother named James. He works in the dental field too as a hygienist. 5. Tell us one of your bad habits? 7. What is your favourite radio station? CBC. I like local stories and learning about current events. 8. What are you most self-conscious about? Probably the staining on my teeth. My mom took tetracycline when pregnant which we now know causes teeth staining. I’m a bit self-conscious about it because I worry people expect me to have perfect teeth since I’m a dentist. 9. Do you have any guilty habits? 😊 I have a pretty good Clash of Clans game going on my phone. 10. What was the happiest moment of your life so far? The past year was so great. The love of my life, Amanda, said yes to marrying me. 👰 And, I became owner of Norwood Dental Centre where I can now practice dentistry on my terms in an amazing community. I have much to be thankful for!